The self-publishing market is crowded with books, making it difficult for individual authors to stand out. Book tours have long been an established tradition among authors, but while they provide fantastic opportunities for connecting with readers, they can pose some significant challenges in terms of cost and time. Technology has provided the perfect solution in the form of a virtual book tour, a process which combines many of the highlights of the traditional form with the benefits of the digital universe. 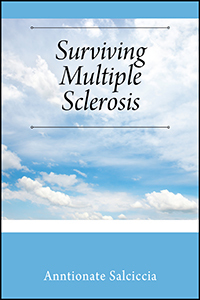 Enter Outskirts Press author Anntionate Salciccia, whose latest book, Surviving Multiple Sclerosis, provides an insider’s perspective on multiple sclerosis (MS). Her book chronicles her successes in managing her symptoms by combining her vegetarian lifestyle with meditation and a specialized exercise regimen. As anyone suffering from chronic pain or illness can attest, this is no mean feat … and Salciccia is here to share her wisdom with us! Anntionate Salciccia sat down with us to answer a few questions about her book by way of a virtual book tour, giving you unparalleled access to her insight and a behind the scenes glimpse into the writing of her book. OP: Tell us, why did you decide to write Surviving Multiple Sclerosis? AS: One of the main reasons I decided to write my life story was to show anyone with an illness or facing great pain, that it is possible. It is possible to survive, I myself am a testimony to this fact, having lived with an illness that gives me constant pain, 24/7. I manage my multiple sclerosis (MS) without pain medication. It is possible! OP: Can you describe what material the book covers? 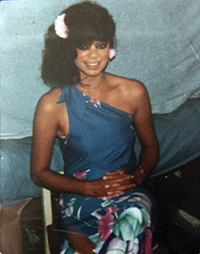 AS: The book begins with my story, and how I deal with different challenges and obstacles I have gone through over the course of my life, some without MS and some with or because of MS. Many of the challenges I have faced have to deal with pain, memory, and managing physical difficulties without pain medication. OP: What was the publishing process like for you, and what’s next? AS: I had my book published through Outskirts Press. It’s the first book I have ever written, but I plan on writing a children’s book in the future. OP: What makes your book different? What does it have that other books on multiple sclerosis (MS) do not? AS: I have done and seen many extraordinary things in my life, and I have had some extraordinary jobs, like being an extra in movies and working on a cruise ship. I have even passed my test to become a firefighter. I have done all of this while living with chronic pain and illness. What’s so special about Surviving Multiple Sclerosis? It chronicles how I overcame challenges through prayer and meditation, and I hope that it serves as a source of inspiration for others. OP: Thank you for sharing your book with us, Anntionate! We can’t wait to see what adventures life takes you on next. We look forward to learning more about you as you visit with other bloggers! Anntionate Salciccia is a mother of 4 children and a Christian that prays twice daily. She enjoys reading other author’s autobiographies, and also enjoys vegetarian cooking. She would like the readers to know that 10% of the proceeds of this book will be donated to the MS Society. Next Next post: 6 Ways to Make Your Library an Ally During National Library Month!